NEW! 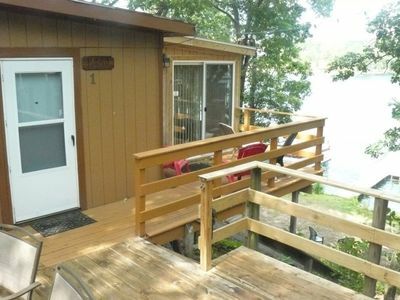 Cottage w/ Lake Access - 1 Mi. to the Dells! 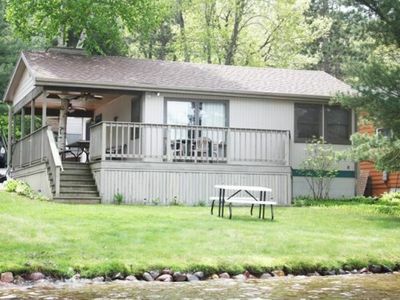 Grab the family and prepare for a relaxing lakeside retreat at 'Pine View Cottage,' a 2-bedroom, 1-bath vacation rental in Wisconsin. 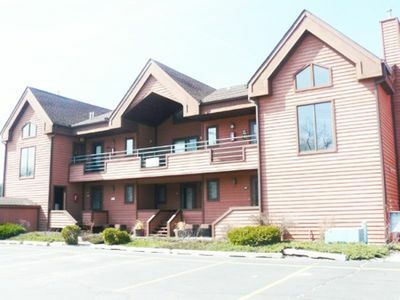 Situated across the street from Lake Delton and just 1 mile from Dells' attractions like Noah's Ark Waterpark and Mt. 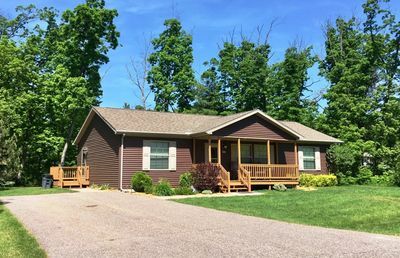 Olympus and 2.5 miles to downtown, this home offers the perfect balance of modern entertainment in a wilderness setting! 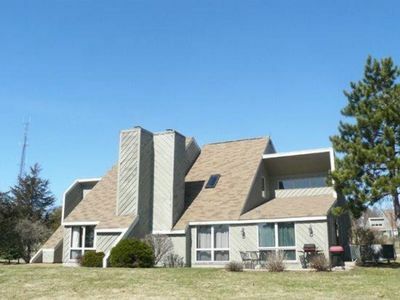 Boasting accommodations for 6, 700 square feet of living space, and direct beach access, this alluring property has it all! 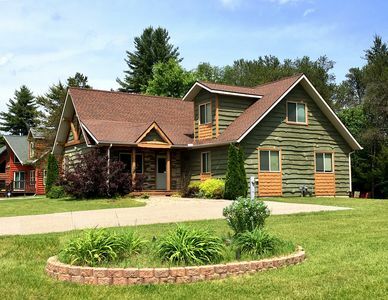 It doesn't get much better than life by the lake, and this gorgeous home is the perfect place to spend time with friends and family. 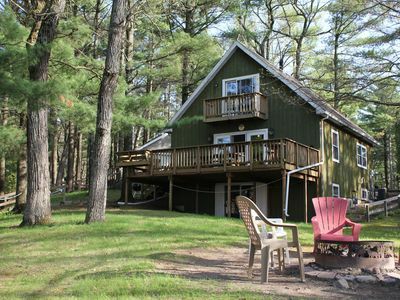 Kick off your vacation with a cookout on the front porch complete with a charcoal grill and outdoor dining set for 4. 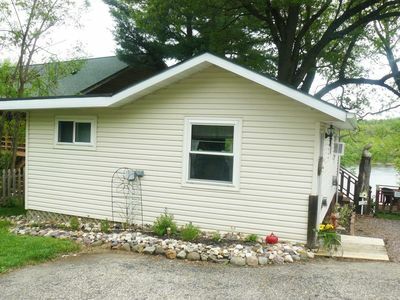 You're sure to spend quality time in the immense front and backyard. 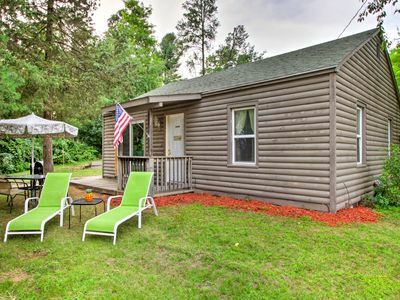 Take in the summer sun from one of the loungers while you keep an eye on the kiddos playing a game, or walk down together to the beach for a swim in Lake Delton. 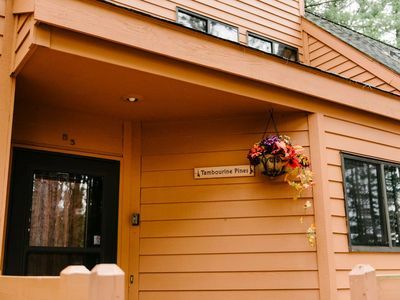 Stepping inside the property, you'll be impressed with the spaciousness and charm of this well-appointed interior, offering a lovely retreat to return to after your adventure-filled days. 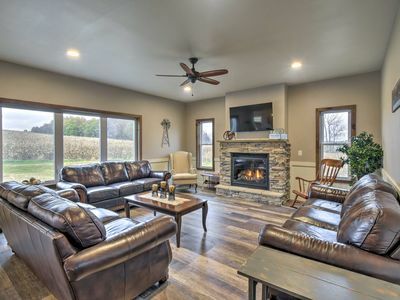 Unwind on the plush leather sectional in the open-concept living area featuring an elegant electric fireplace, a large flat-screen cable TV, Blu-Ray player and classic Nintendo Entertainment System with over 600 games. 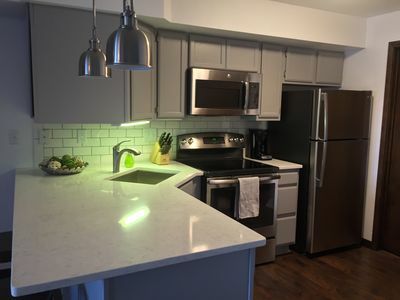 Whip up some cocktails for the group in your fully equipped kitchen outfitted with stylish cabinetry, ample counter space and a breakfast bar with seating for 4. 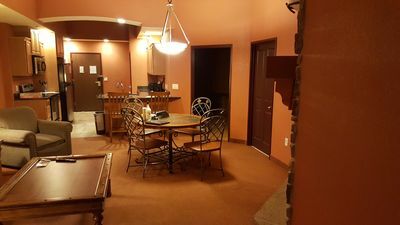 As your eyes begin to grow tired, retire to your master bedroom highlighted by a lustrous queen bed, a ceiling fan, and flat-screen TV with a DVD player. The others can enjoy nights of peaceful sleep in the additional twin-over-twin bunk bed and pullout bed in the living room. 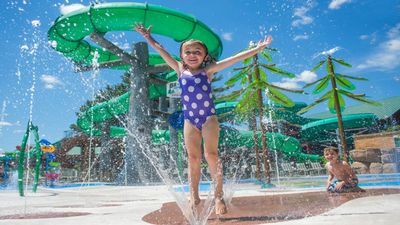 Situated just 1 mile from The Waterpark Capital of the World, start your adventure at Wisconsin Dells' famous attractions, including Noah's Ark Waterpark, Mount Olympus, and Kalahari Resorts Dells. Guests visiting during the summer months will even receive complimentary tickets to Mount Olympus! For more family fun, just 3 miles away the Riverside & Great Northern Railway is a must do! For dinner, the kids are sure to enjoy Buffalo Phil’s Pizza & Grille where classic American comfort food is delivered via model train. 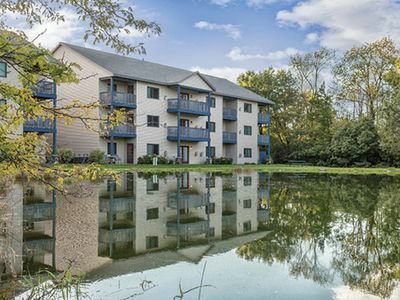 Spend a day splashing and playing in Lake Delton just 100 feet from the property. Be sure to check the Tommy Bartlett Show schedule to watch Lake Delton come to life through jaw-dropping water-skiing stunts and acrobatics. 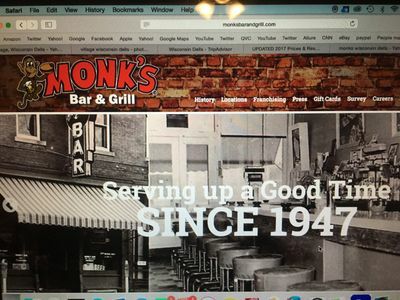 When you have the urge to dine out, try some of the local fun favorites in downtown Wisconsin Dells, such as High Rock Cafe, Monk's Bar & Grill, or River's Edge Rustic Pub & Grub. Before heading home, play a round of mini-golf at Pirate's Cove Adventure Golf or stop by the Ripley's Believe It Or Not Museum. 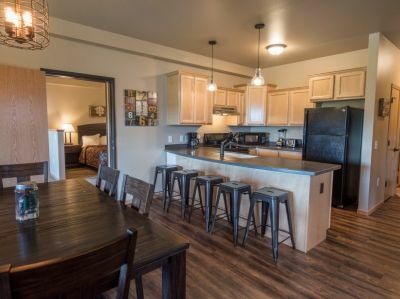 - Amenities include a fully equipped kitchen, free WiFi, 3 TVs (2 flat-screen TVs with cable, 1 tube TV), Blu-Ray player, classic Nintendo Entertainment System with over 600 games, electric fireplace, large yard, fire pit, charcoal grill, air conditioning, heating, plenty of parking for cars and boat trailers, and more! 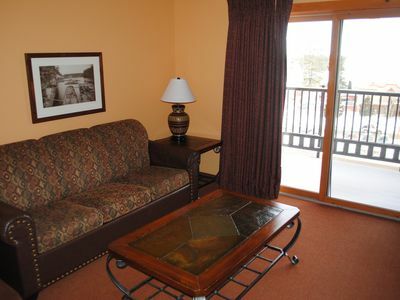 - Stays during the summer months (Memorial Day through Labor Day) include waterpark tickets to Mt. Olympus! 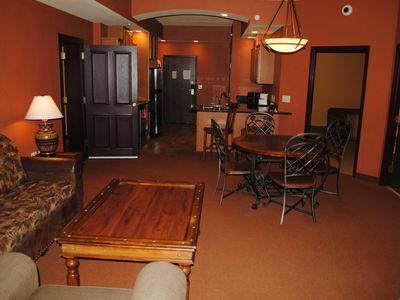 A beautiful resort with pools, hot tubs, 13 ski hills & more!! !